The liberal politicians are brazenly censoring the Oregon public by stuffing most of their bills with “Fake Emergency” clauses. 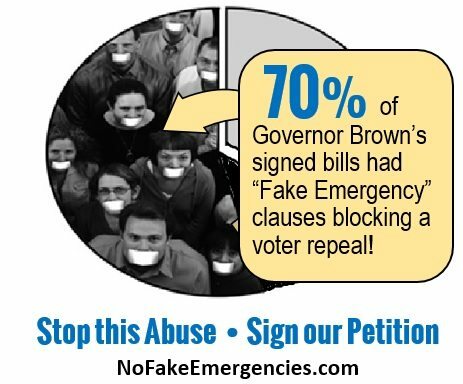 By the current count, nearly 70% of the bills signed into law by Governor Brown contained a “Fake” Emergency Clause which has the legal effect of blocking voters from immediately repealing the law through a citizen referendum drive. This is why you must sign the petition to stop the abuse of emergency clauses. Sign the No Fake Emergency petition here.Some bills appeared to be emergency related but others grossly off-mark. Ask yourself, do these signed bills sound like an Emergency? The more controversial the bill was the more likely it had an Emergency Clause. For instance, the Anti-coal bill (HB 4036) and the blacklisting gun owner database bill (SB 1551) all had emergency clauses on them. Please help us. The politicians will not stop abusing their power on their own. We must change the law to secure Oregonians right to repeal bad laws. Please sign the No Fake Emergency petition here.